I am cutting NuVasive (NUVA) on a chart that is telling me someone with a lot more insider information than I do is not liking something. Normally I'd exit wholesale but I still like the fundamental story here, so I'm going to keep a 0.1% stake - generally I focus less on companies I sell out of completely so I want to see what the end game is here. 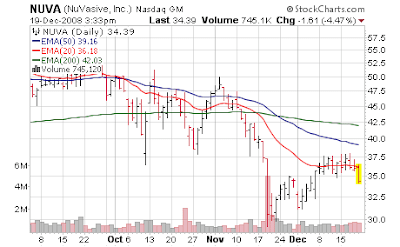 As I've been saying, we want to focus on companies whose charts have improved materially here in this 3 weeks of peace; NuVasive has not even made a serious attemt to challenge its 50 day moving average (from below) - hence being the cynic I am about the stock market & believer in price action; I have to think "those in the know" know something that I don't.